A table (Le Dejeuner), an 1892 oil painting by Edouard Vuillard, appears to show a quiet domestic scene. But Isabelle Cahn, the curator of a new show at the Musee d'Orsay, says this painting actually depicts a scandal-ridden household. Vuillard's 1891 portrait of Bonnard is an intimate depiction of an artist at work. Both portraits are part of the Hays Collection, currently on display at the Musee d'Orsay. Spencer and Marlene Hays' collection of French art usually adorns the walls of their Nashville home, an exact replica of a French palace. But for a few months, those pieces are back in their country of origin, on loan to the Musee d'Orsay. In 1891, the artists and lifelong friends Pierre Bonnard and Edouard Vuillard created complementary portraits of each other. 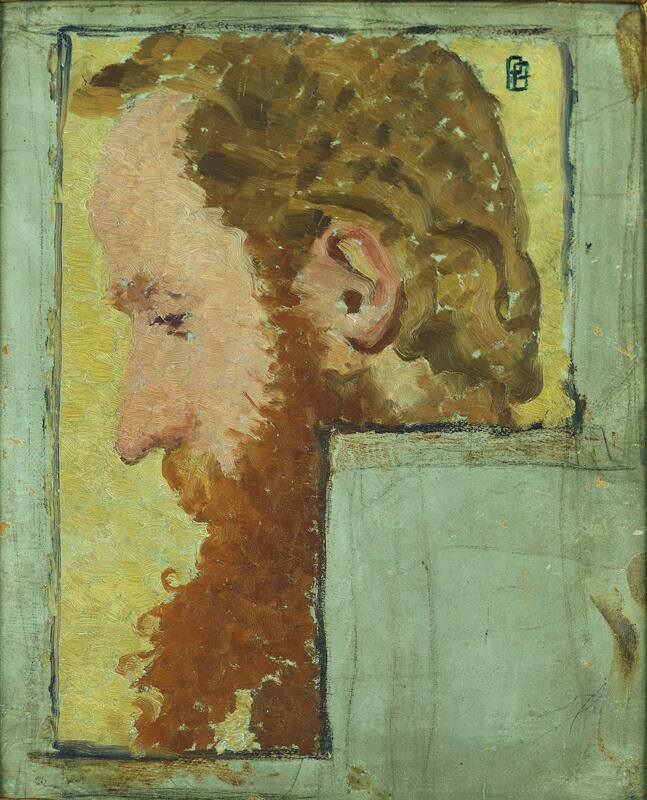 Here, Bonnard's portrait of Vuillard emphasizes the painter's red beard. To say that Nashvillean Spencer Hays is crazy for French art is an understatement. "French art just quickens our step, fires our spirit and touches our heart," he says. Hays' passion began when he was in his 30s. By then he was already a millionaire; Forbes estimated his worth at $400 million in 1997, money earned from book-selling and clothing businesses. Hays had humble beginnings. "When Marlene and I grew up in a little old town in Texas, even visiting France was far beyond our expectations," Hays says. "But in 1971, we made our first trip to Paris, and our love affair with this wonderful country began. We've returned every year, and our passion has grown." As the Hayses' love of France grew, so did their collection of French art. Some of their pieces have now made it back to their country of origin: Created in France and brought to Tennessee, the Hays Collection is currently on display in Paris at the Musee d'Orsay. Guy Cogeval, the head of the museum, says he's impressed by Hays' passion. "Very, very rarely in my life," he says, "did I see a person so much in love with French art." Cogeval says the Hayses' Francophilia shows in the home that they built in Nashville, Tenn. — "a real palace," Cogeval says. 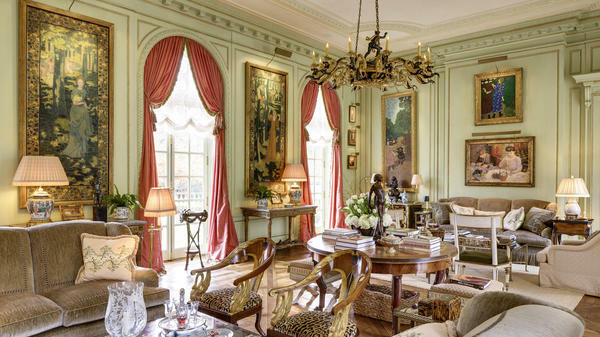 That's no exaggeration: Spencer Hays' house is an exact replica of a palace built in France in 1724. "He wanted to use the limestone from Paris and he wanted every button, every opening, every faucet exactly to be French," Cogeval says. The Hayses raided French antique shops for the furniture and silverware to fill the house, and inside that Nashville palace they installed all the French art they'd been collecting. Many of the works in their collection were made in the 1890s by artists called the Nabis — French for "prophets." These painters moved beyond impressionism, using flat colors and Japanese-inspired composition. Two of the Nabis — Pierre Bonnard and Edouard Vuillard — were lifelong friends. "We have a wonderful painting by Bonnard of Vuillard and then Vuillard of Bonnard," Hays says. "And they were in their 20s when they each did that of the other." 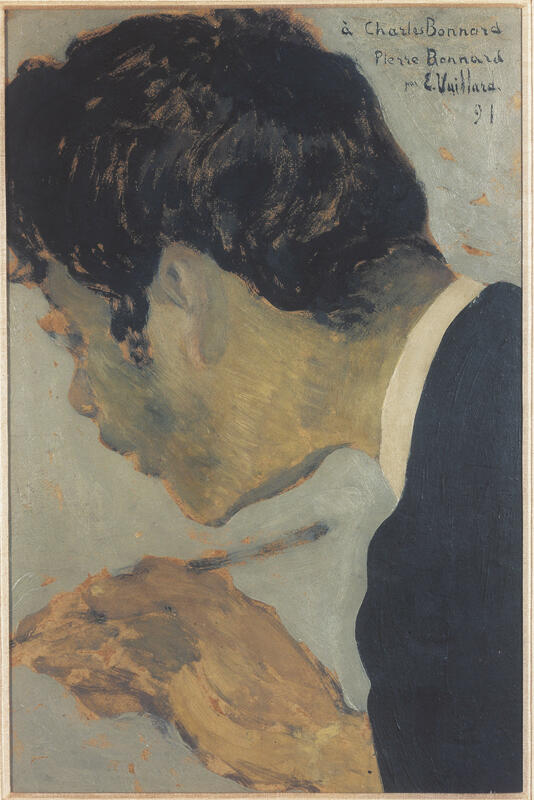 Bonnard's 1891 painting of Vuillard shows his friend in profile. "His beard is so red you can't believe it," Hays says. "The colors are so strong, and you can see the curls in his beard. And you can just tell the passion they had for each other and the movement." Red-headed Vuillard, in the same year, paints Bonnard making art. Isabelle Cahn, curator of the Musee d'Orsay show, says Bonnard seems intent on the brush he's holding. "He doesn't look at us. He look[s] very carefully to his drawing or his painting," she says. "It is a very intimate portrait." These are early works, not great ones. But Guy Cogeval says that a decade later Edouard Vuillard had developed a rather healthy ego. "In the year 1900 he's 32 years old, and he considers himself one of the greatest living artists and the savior of art," Cogeval says. Fans of Vuillard, like the Hayses, would agree. And in this Musee d'Orsay show, you can see the eye of the artist, and his collectors, develop as the years go by. In 1895, Vuillard made a terrific painting, A table (Le Dejeuner), which curator Isabelle Cahn says depicts a scandal. "This scene is about infidelity," she says. At first glance, the painting seems to be depicting a nice family meal: An old lady, a bearded man and a young woman in a red, lace-trimmed blouse sit around a dining table. It seems benign enough. But the bearded fellow is in motion. "A lot of men I know, when they get angry at the table, they push back," Hays observes. "And that's what he's doing." 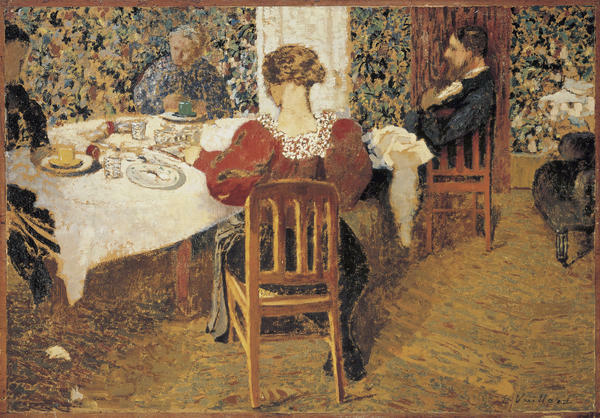 The woman in the red and lace blouse is Vuillard's sister Marie; she's married to the bearded table-pusher, Ker-Xavier Roussel, another Nabi, who's Vuillard's closest friend. Roussel is consistently unfaithful — he's cheating on his best friend's sister. Cogeval says that the brothers-in-law remained best friends, even as Roussel kept up his scandalous behavior. "He did that for a very long time," Cogeval says. "During the '30s he was still bringing models, women models, into his atelier, and wished the family to go upstairs and leave him alone inside the atelier." Cogeval found the evidence of this family drama in letters and diaries — see how much fun art experts can have? The owners of that Vuillard with the racy backstory, Marlene and Spencer Hays of Nashville, Tenn., have helped to launch the American Friends Musee d'Orsay. The group will attempt to bring American money to the great French museum at a time when national budgets are tight. Certainly a help to the Musee. Did it also help get the Hays Collection onto the walls of the Orsay? "This is an amazing collection," curator Isabelle Cahn says. "When Spencer came before the opening of the exhibition, he told me that he was afraid that his collection was not at the same level as the paintings and the sculpture in the Musee d'Orsay. But now we know that it is the same level. It is why it is so beautiful, and we are so happy to have it." Not all visitors may agree. But in Spencer Hays' view, the pictures he's collected over the years, especially the works of the Nabis, are indeed marvelous. "Every night before I go to bed," he says. "I spend at least 45 minutes to an hour plus walking around looking at every painting. Because that's what's so wonderful about the Nabis — you can always discover something else." More than 100 works of art from the Marlene and Spencer Hays Collection are on view at the Musee d'Orsay in Paris until mid-August. So for at least a little while, Spencer Hays might find his nighttime prowls a bit curtailed. In Paris right now, the love affair between a couple in Nashville, Tennessee and the French artwork they collected over the years is on view at the Musee d'Orsay. NPR special correspondent Susan Stamberg spoke with the American lenders and the French borrowers. SUSAN STAMBERG, BYLINE: To say that Nashvillian Spencer Hays is crazy for French art is an understatement. SPENCER HAYS: French art just quickens our step, fires our spirit and touches our heart. STAMBERG: The passion began when Mr. Hays was 30-something. By then, he was a millionaire. Forbes estimated his worth at $400 million in 1997, rich from clothing and book-selling businesses. He and his wife did not start out that way. HAYS: When Molly and I grew up in the little town in Texas, even visiting France was far beyond our expectations. But in 1971, we made our first trip to Paris, and our love affair with this wonderful country began. We've returned every year, and our passion has grown. GUY COGEVAL: I'm really impressed, because very rarely in my life did I see a person so much in love with French art. STAMBERG: Guy Cogeval, the head of the Musee d'Orsay, says you see Francophilia in the home the Hayses built in Nashville, Tennessee. COGEVAL: A real palace, a French palace copied from the Hotel de Grenelle. STAMBERG: A palace built in Paris in 1724. Spencer Hays has an exact replica. COGEVAL: He wanted to use the limestone from Paris. And he wanted every button, every opening, every faucet to be French. STAMBERG: Plus all the furniture, the silverware - the Hayses raided French antique shops. And into their Nashville palace, they put all the French art they had been collecting, much of it made in the 1890s by artists who were called the Nabis - it means prophet - painters who moved beyond Impressionism with flat colors and Japanese composition. Two of the Nabis, Pierre Bonnard and Edouard Vuillard, were lifelong friends. HAYS: We have a wonderful painting by Bonnard of Vuillard, and then Vuillard of Bonnard. And they were in their 20's when they each did that of each other. STAMBERG: Bonnard paints Vuillard in profile. HAYS: His beard is so red, you can't believe it. The colors are so strong. And you can see the curls in his beard. And you can just tell that the passion that they had for each other and for the movement. STAMBERG: Red-headed Vuillard paints his friend Bonnard making art. Isabelle Cahn, curator of the Orsay show, says Bonnard is intent on the brush he's holding. ISABELLE CAHN: He doesn't look at us. He looks very carefully to his drawing or his painting, and it is a very intimate portrait. STAMBERG: You really see an artist at work, concentrating. His eyes are concentrating on whatever it is he's working on. CAHN: That's true. That's true. STAMBERG: These are early works made in 1891, not great ones. But Orsay director Guy Cogeval says a decade later, Edouard Vuillard had developed a rather healthy ego. COGEVAL: In the year 1900, he's 32 years old, and he considers himself one of the greatest living artists and the savior of art. STAMBERG: Fans of Vuillard - the Hayses, for example - would agree. And in this Orsay show, you can see the eye of the artist and his collectors develop as the years go by. In 1895, Vuillard made a terrific painting which curator Isabelle Cahn says involved scandal. STAMBERG: Really, infidelity? It looks like a nice family scene. It's called "The Table," the end of luncheon at Madame Vuillard's. Sitting around a white tablecloth, an old lady - she almost disappears into the densely flowered wallpaper - a bearded man and a young woman in a red blouse trimmed in white lace. We only see her back. Benign enough, but wait. The bearded fellow seems to be in motion. HAYS: I know - a lot of men I know, when they get angry at the table, they push back. And that what's he's doing. COGEVAL: He kept his friendship with his best friend. STAMBERG: But he was a scoundrel this man, and he was cheating on the wife - the sister. COGEVAL: Yeah, and he did that for a very long time. During the '30s, he was still bringing models - women models - in his atelier, and wished the family to go upstairs and leave him alone inside the atelier. STAMBERG: That woman, the sister, should have dumped that guy. STAMBERG: Musee d'Orsay director Guy Cogeval found the evidence of all this in letters and diaries. You see how much fun art experts can have? The owners of that Vuillard with the racy back-story, Marlene and Spencer Hays of Nashville, Tennessee, have helped to launch American Friends of Orsay to bring American money to the great French museum when national budgets are tight. That will help the Orsay. And did it help get the Hays Collection onto the walls of the Orsay? What do you think of the overall quality of this collection? CAHN: This is an amazing collection. STAMBERG: Again, curator Isabelle Cahn. CAHN: When Spencer came before the opening of the exhibition, he told me that he was afraid that his collection was not at the same level as the paintings and sculpture in the Musee d'Orsay. But now, we know that it is the same level, and it is why it is so beautiful. And we are so happy to have it. STAMBERG: Well, not all visitors may agree. No matter. In Spencer Hays' view, the pictures he's collected over the years - especially the ones made by the Nabis - are indeed marvelous. HAYS: Every night before I go to bed, I spend at least 45 minutes to an hour-plus walking around looking at every painting. Because that's what's so wonderful about the Nabis, you can always discover something else. STAMBERG: More than 100 works from the Marlene and Spencer Hays Collection are on view at the Musee d'Orsay in Paris until mid-August, which might shorten Spencer Hays' nighttime prowls - for a while, anyway. I'm Susan Stamberg, NPR News. Transcript provided by NPR, Copyright NPR.